Protexin Professional 5g Sachet for all animals and birds is a highly concentrated soluble formula to rapidly restore the micro flora in the gut. Easy to use sachet presentation, ideal for young animals transferring to a new home. 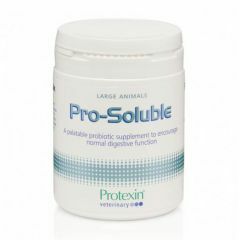 Protexin Pro-Soluble for Large Animals is a soluble, every-day probiotic supplement to encourage normal digestive function. Diarsanyl Plus Oral Paste for Foals and Calves helps to support intestinal function and helps maintain the natural balance of the intestine. This helps treat and prevent diarrhoea.